Pultizer Prize winning Writer Junot Diaz Celebrates Comics Culture : COMICS ARE EVERYWHERE! Great writers find inspiration from any number of sources – music, visual art, movies and, of course, in the pages of books pulsing with narrative possibilities. Pultizer Prize-winning writer Junot Diaz is no exception. Best-known for the critically acclaimed and award-winning 2007 novel The Brief, Wondrous Life of Oscar Wao and the 1996 short-story collection, Drown, Diaz’s fiction pulses with pop-cultural references as ranging from movies and TV shows to pop music filtering in from the vast jukebox of the writer’s memory. And comics and the characters populating the panelled universe of their pages are prominently featured in his storytelling. Diaz gives props to comics and their impact on his sensibility by opening his novel The Brief Wondrous Life of Oscar Wao with the quote “Of what import are brief, nameless lives … to Galactus?” from Stan Lee and Jack Kirby’s collaboration on Fantastic Four from 1966. 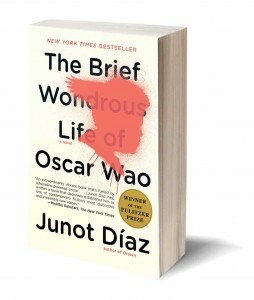 Junot Diaz's award-winning novel, "The Brief Wondrous Life of Oscar Wao"
The main character of Diaz’s novel is a comics-obsessed nerd who finds solace and comfort from the slings and arrows of adolescence by embracing comics and literature while the rest of world ostrasizes him for being overweight and out of sync with his Dominician-American community. If you love new, exciting fiction with a fresh and unique voice, do yourself a favor and check out The Brief, Wondrous Life of Oscar Wao. Like Michael Chabon’s fiction, some of the cultural texture and ebb and flow of Diaz’s prose can be attributed to his love of comics. So, it makes perfect sense to hit a Brooklyn-based comic-book shop with Diaz as our guide as he shares anecdotes about his favorite picks and muses on what wonders await readers willing to take a chance on something unfamiliar. Wandering through the stacks of new comics and searching through the deluge of older titles, Diaz is always on the lookout for a comic promising to floor him and sweep his mind into another world. Diaz is an avid reader claiming to read more than one book a week, and comics are just as important and necessary as novels and short stories in his mind. Diaz is currently working on a science-fiction novel where his obsessive love and knowledge of genre fiction and cinema will emerge in full bloom. The book is titled appropriately enough Monstro and Diaz recently spoke to Wired magazine about his fascination with comics, science fiction and fantasy. Diaz argues that all forms of art have something to offer their audiences. And comics with their dense fusion of words and pictures are a gold mine for writers, artists and storytellers of all kinds looking for stories to jump off the page. Diaz’s whip smart intelligence and multi-ethnic perspective is coupled with a witty, street-smart sense of humor, and he is quickly becoming one of my favorite, new writers. Diaz wears his unapologetic, geek love for comics openly and for good reason. he understands and articulates how the best comics are more than just entertainment. Like any art, they can be a means of articulating inspired observations and questions about the complexity of the human condition and our understanding of our place in the world. Diaz’s wonderfully original writing rocks and the alchemy of comics and their black magic of storytelling continue!